For those who have been searching for the elusive jackfruit for their recipes (it makes some very interesting meat alternatives, especially vegan "pulled pork"! 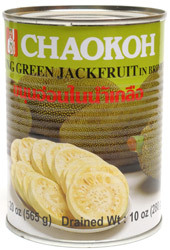 ), Chaokoh's Young Green Jackfruit is just what you're looking for. Packed in brine without any added sugars that many other brands of canned jackfruit have, it's the perfect way to have this exotic ingredient handy for experimenting in your own recipes, or, for having that "missing ingredient" from many of the unique vegan recipes that have come about over the past few years. 20 oz. (565g) can contains 10 oz. (280g) of jackfruit when drained. $2.99 per can.